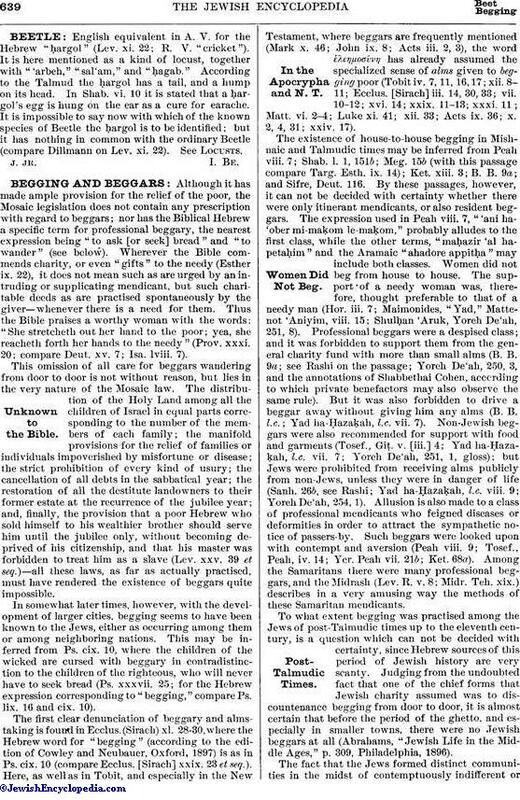 English equivalent in A. V. for the Hebrew "ḥargol" (Lev. xi. 22; R. V. "cricket"). It is here mentioned as a kind of locust, together with "'arbeh," "sal'am," and "ḥagab." According to the Talmud the ḥargol has a tail, and a hump on its head. In Shab. vi. 10 it is stated that a ḥargol's egg is hung on the ear as a cure for earache. It is impossible to say now with which of the known species of Beetle the ḥargol is to be identified; but it has nothing in common with the ordinary Beetle (compare Dillmann on Lev. xi. 22). See Locusts.